You’ve asked and I’m here to answer. 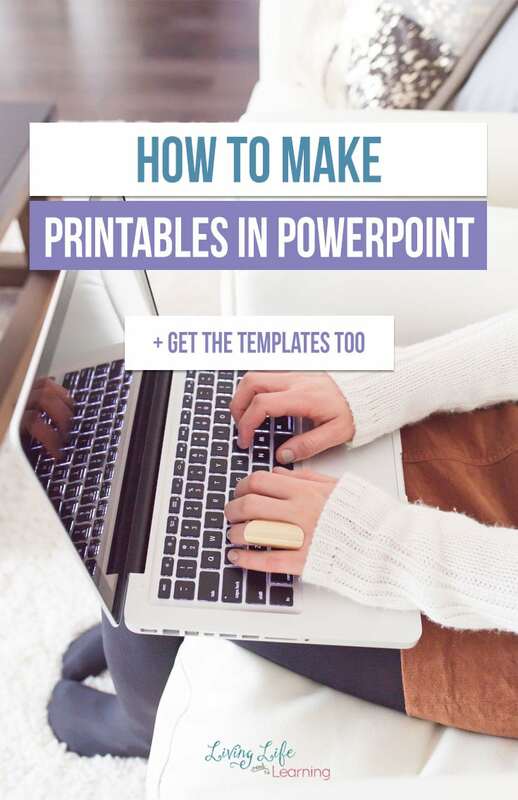 You want to know how to create printables in PowerPoint so you can try to make your own printables at home. Imagine if you could stop buying other people’s resources and start making your own. You could study any topic you wanted and at any grade level you needed. You want to learn about pirates or fossils? 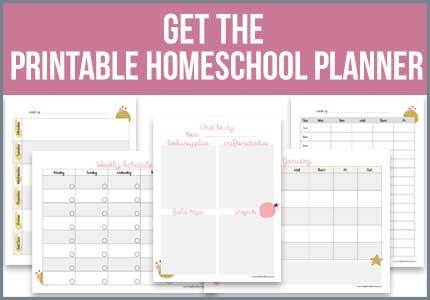 Create the printables that would go along for each topic knowing that you could create something your kids would love. What is the best program to make printables? As a designer, I use Indesign and I love it. As homeschoolers, you can purchase Adobe Creative Cloud at a discount and get all of the apps. This is great if you have middle school age and teens at home who can learn how to use the programs too. 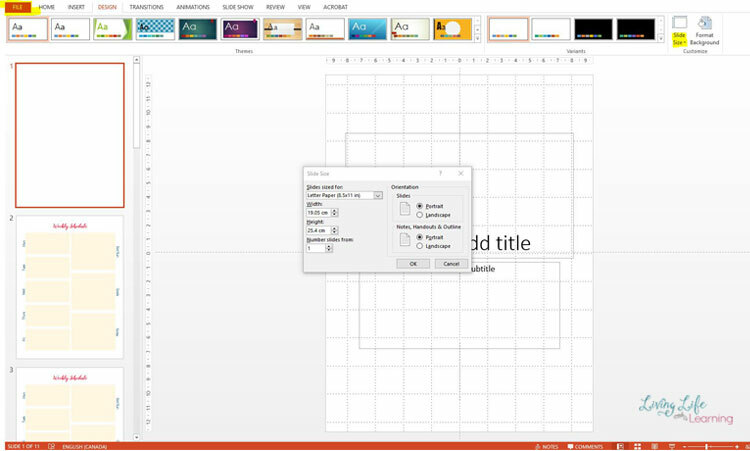 For this tutorial, I’ll be using PowerPoint, it’s widely available on both Mac and PCs. You can make a one time purchase for Microsoft Office or subscribe monthly starting at $6.99/month if you don’t already own it. If you’re only creating personal projects for your family with no intention of distributing them, you can use any fonts or images that allow you to save and upload them to your computer. You can always read the terms of service for websites that offer free graphics to see if it is applicable for you to use. 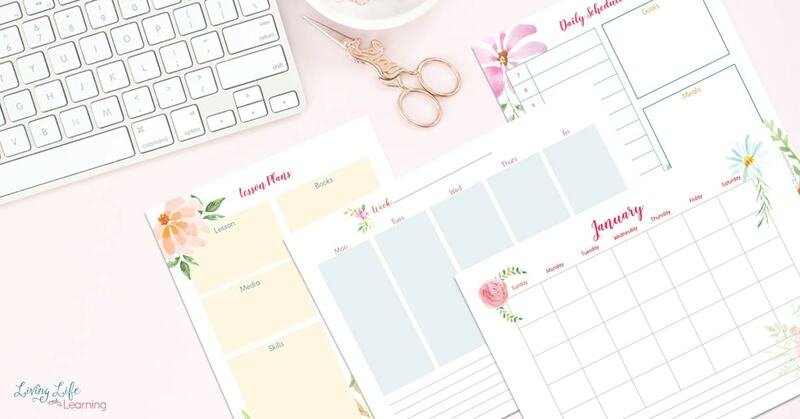 If you’d like to distribute your printables either for free or for profit, then you need to be much more careful. You can only use commercial-use images, clip-art and this includes fonts as well. Some fonts can be free for personal use but require payment for commercial use. You can find free commercial-use fonts on Font Squirrel and Google Fonts. It’s easy to download them, then you will need to use your desktop/laptop to unzip the file and download the font. Where do I find cute clip art? There are some websites that offer free clip art, but I haven’t found one that I absolutely love. I do enjoy Teacher’s Pay Teacher’s for clip art and there are a ton of freebies or cheap clip art there for purchase. A lot of clip art artists also provide freebies for you to sample their work. Of if you prefer, here are the instructions below. 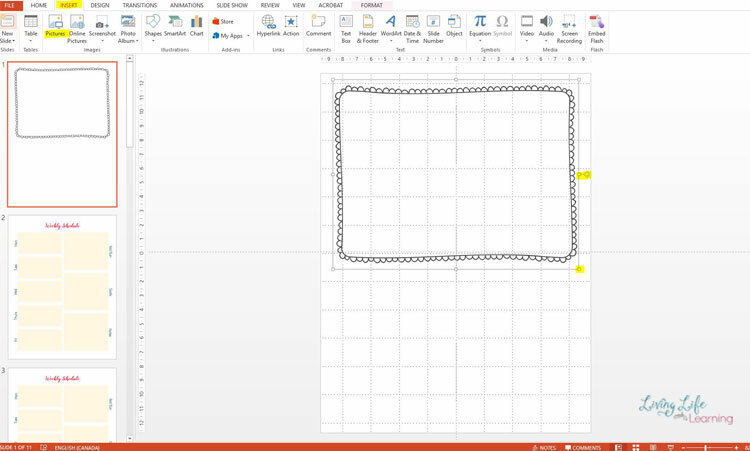 Open up PowerPoint and from the design tab, under slide size you can change the size that you need or orientation if you need to change from portrait to landscape. I always make it letter size for printing. 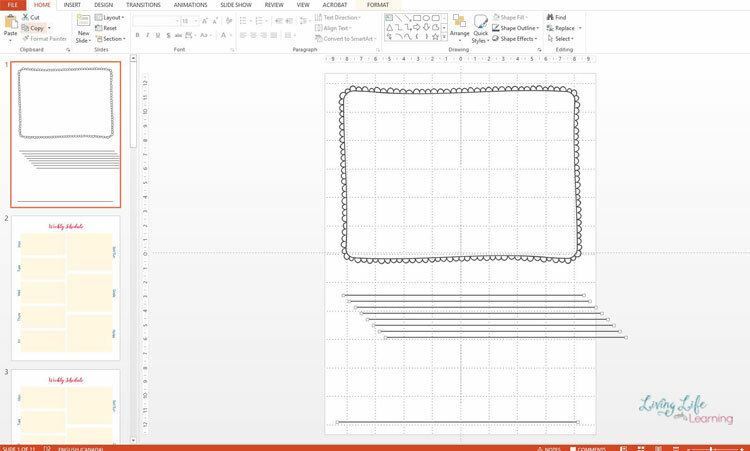 Under view, I always have my guides and gridlines turned on so that as I’m adding elements to my printables, I can position them correctly. 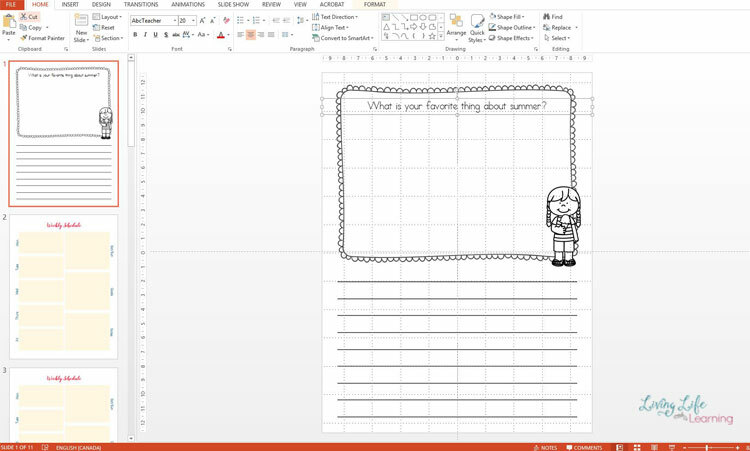 I have a set of clip art borders that I purchased from Teachers Pay Teachers so to insert I go to Insert –> Pictures to add images to my printables. You will want to add png files rather than jpegs because they won’t have the white rectangle around them. When you add images, you can easily resize them by pulling on the corners or rotate them but clicking and dragging them on the dial. 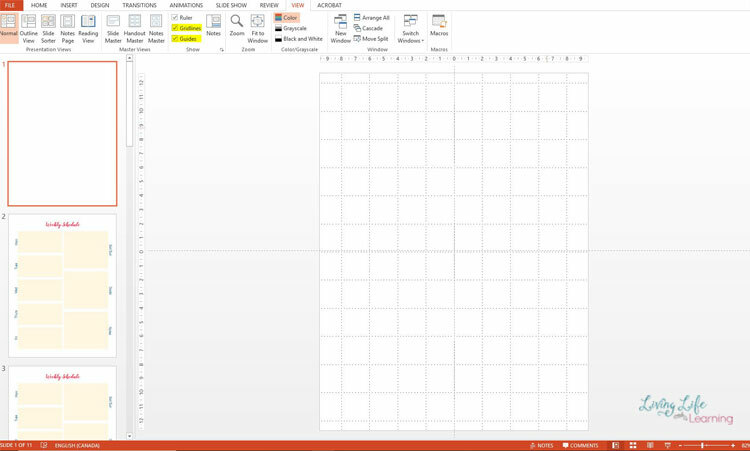 To add a line, from the home page select the line tool. Go to shape outline to choose the color and weight of the line. Once you are happy copy and paste the line several times. Don’t worry that they’re not lined up properly. 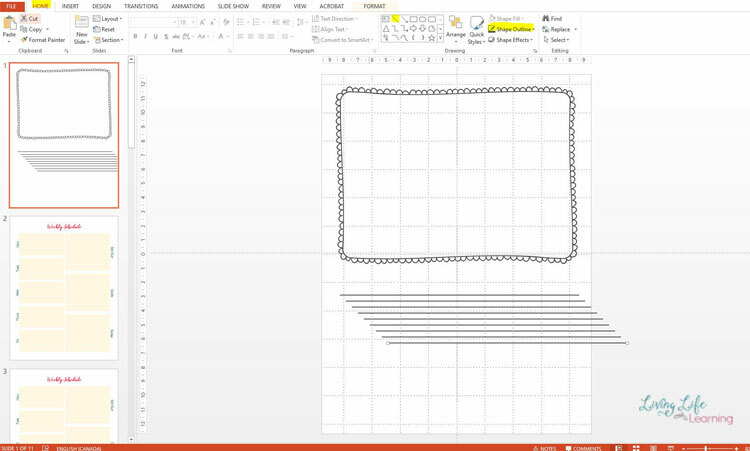 To get the lines aligned, move the bottom line to the bottom position that you want to have your lines sit. Holding shift, click on all of the lines, they will have the circle at the ends like in the image below once they’ve been selected. The from home go to arrange –> align –>align center and then do it again arrange –> align –> distribute vertically. This will align them all together and evenly space them out but you’ll want to move them to the center. While they are still selected, right click and go to group and group again to group all of the lines together. Once they are grouped you can move them all together at once and position them in the center using your gridlines. 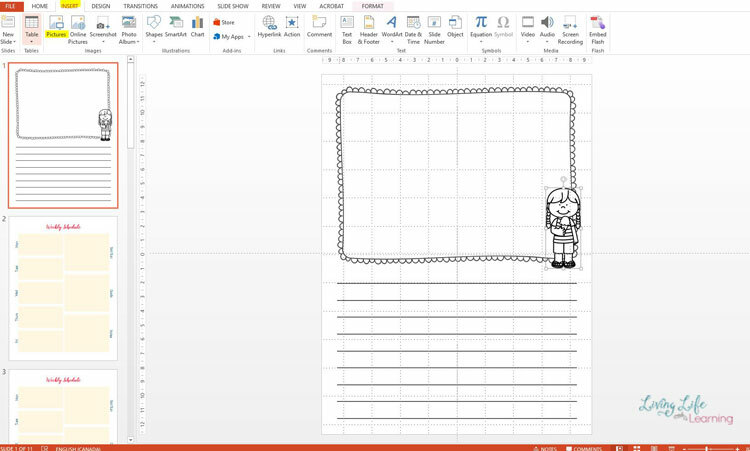 You can add a cute clip art image, by going to insert and picture. Resize and move it into the corner. To add text, go to insert –> textbox. Position the textbox so it spans the whole page, you can choose to align your text to center, change the font and it’s size on top and just type. 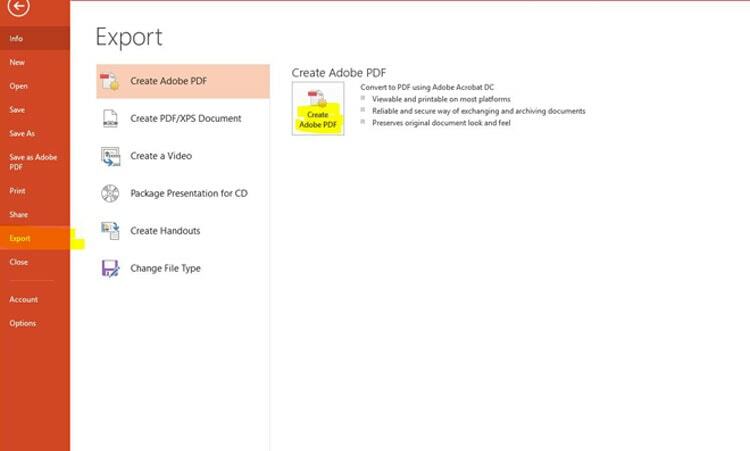 To save the file as a pdf, go to file then export. This format can be used to print on your printer. 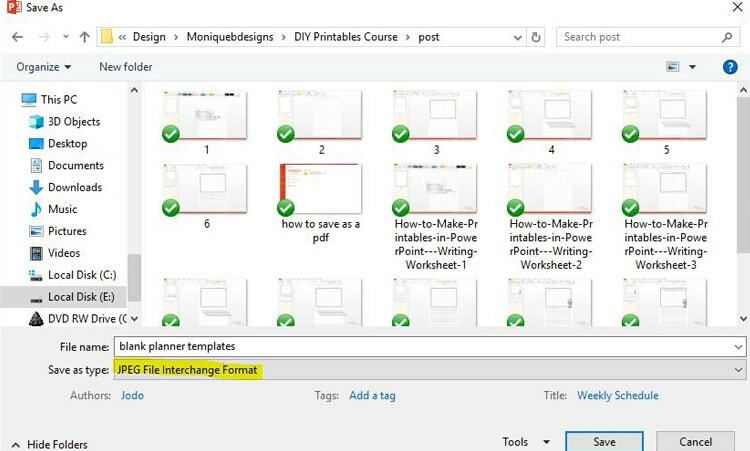 If you’re creating a project to share and want to create a graphic, you can go to file –> save as –> choose jpeg to save your printable as an image file. 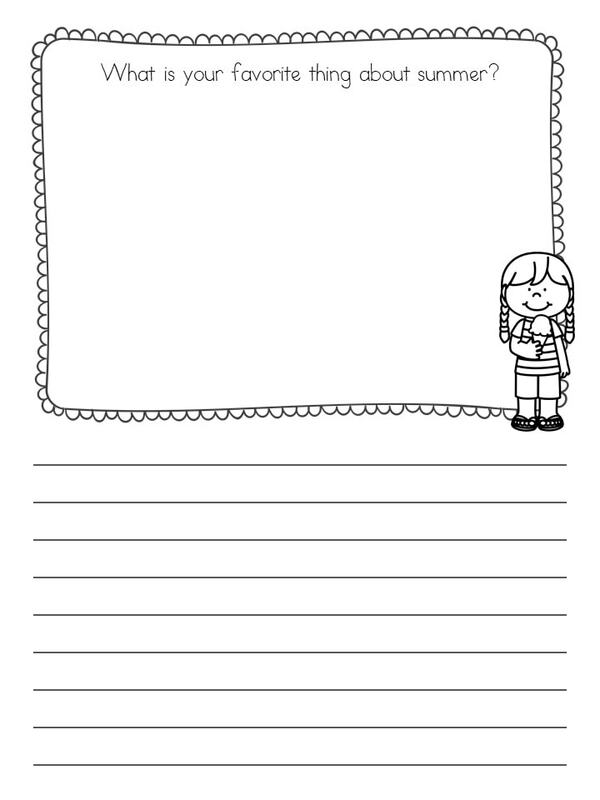 This is what the printable looks like and you can space the writing lines as close or as far apart as you like. 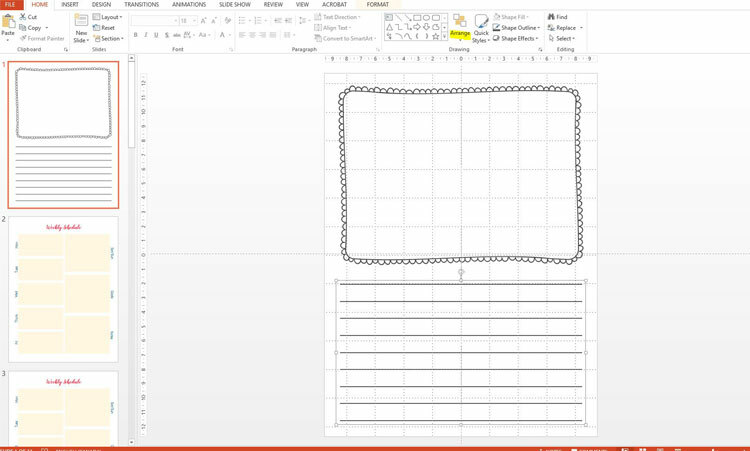 Get these PowerPoint lesson planner templates so you can get started creating your own printables too. 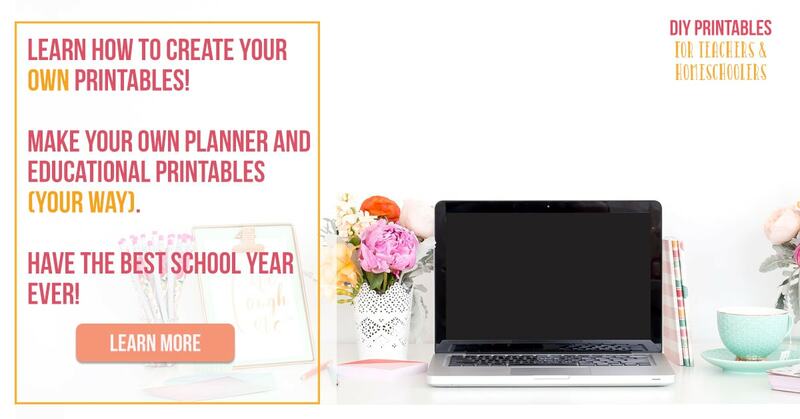 Click on the image to get the templates and planner emailed to you. 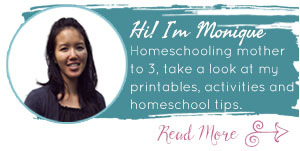 If you want me to hold you hand each step of the way, so you know the exact steps to make your own printables then join DIY Printables for Teachers for Teachers and Homeschoolers right now!